As most of you know, there’s a new name on the Clayton Hotel in Lapp’s Quay. But do you know there is also a new focus on its renamed Globe Restaurant. That focus is local and much of the produce, including my flavourful Tom Durcan steak, is coming from the English Market. The lunch menu is also very much a local one but we were there to sample the evening menu. 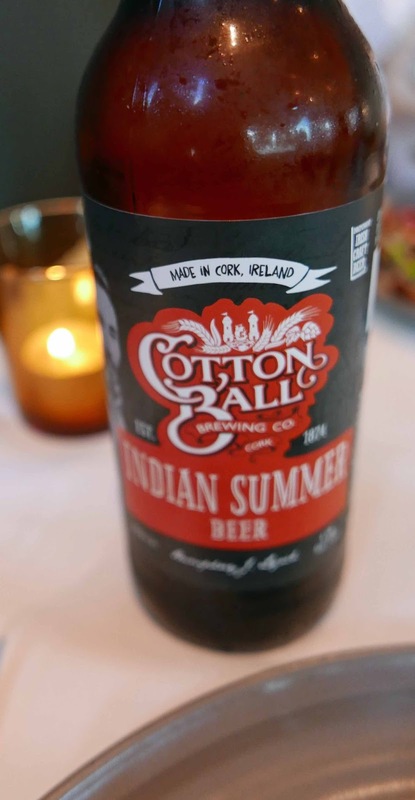 As we studied the lists, we noticed they had a few craft beers on bottle and picked a familiar favourite, the Cotton Ball’s Indian Summer. Service was excellent throughout, very friendly. And that wasn't just us, as we spotted some great interaction with nearby tables, including one American group. The menu highlights the English Market connection, especially with Tom Durcan (for beef), Kay O’Connell’s (for seafood), the Chicken Inn and On the Pig's Back (for cheese). 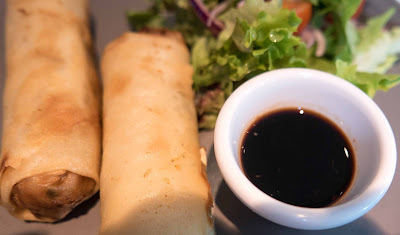 There was an Asian restaurant here before the Clayton took over and as it happened I picked an Asian starter: Spring Rolls (Vegetable spring rolls, pickled cucumber, soy and chilli dipping sauce). Very tasty indeed and just the right size as I knew a steak was to follow! 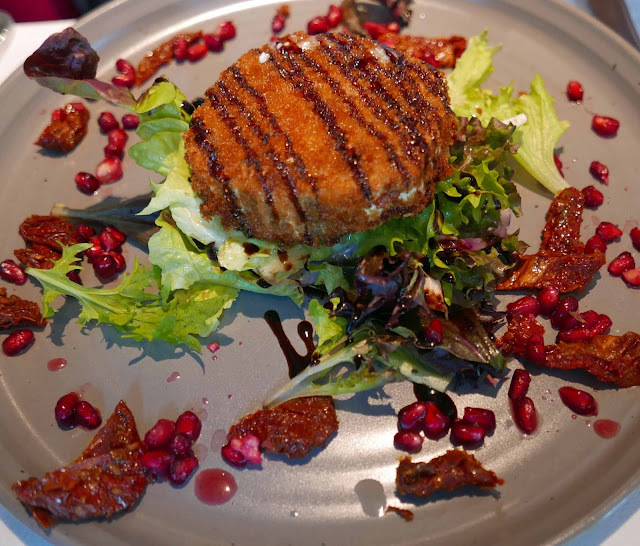 Meanwhile CL was enjoying her local and lovely Ardsallagh goats cheese in a roasted walnut crust, petit salad with sun blushed tomatoes and pomegranate. You may check out the other starters, and indeed mains, online here. My main event, cooked to perfection, was Chargrilled Irish ribeye, served with French fries (jacket potato was also an option), garnish salad, and no less than three sauces: garlic butter, pepper and whiskey sauces. The steak was full of flavour and delicious. 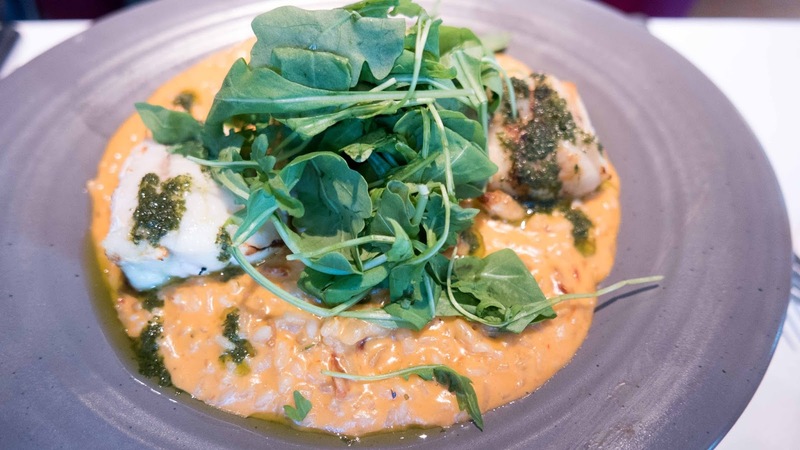 CL went for the Pan fried medallions of monkfish, served with a creamy lemon and basil risotto, finished with sun blushed tomatoes and fresh pesto. Again the fish was cooked to perfection and the risotto (quite a lot of it on the plate!) was also a delight, full of different yet complementary flavours. After all that, we were close to full so agreed to share the dessert, a Classic Eton Mess (Fresh meringue pieces, soft berry fruits and freshly whipped dairy cream). Strawberries topped the big glass and quite a few were buried underneath as well. Very sweet,” said our server, encouragingly. And he was spot-on. Quite a finish to an impressive meal in a comfortable setting. 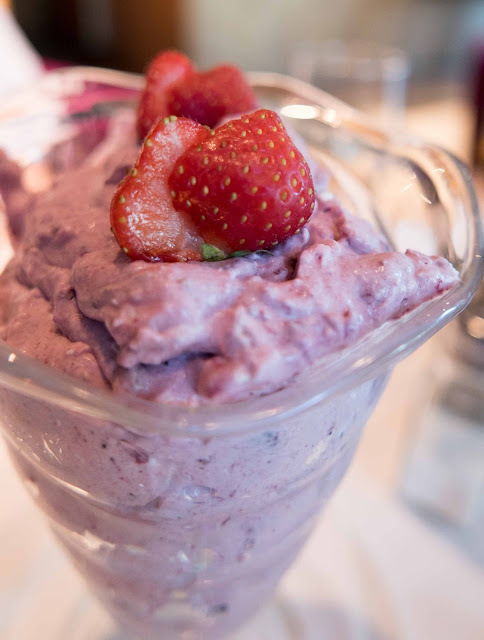 There are quite a few dining options in the Clayton, including what looks like a power-packed Vitality Breakfast, anytime from 6.30am! Lunch in the Globe starts at noon but all day you can enjoy a tea or coffee and some delicious pastry in the Red Bean Roastery in the Atrium. And if have a have an afternoon free and someone to spend it with, then Afternoon Tea is available, also in the Atrium. Enjoy! So there I was in the Jura, ready for my final pilgrimage. 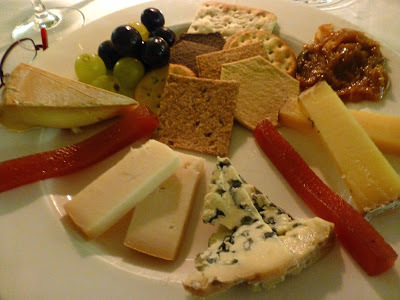 I was looking forward to tasting - for the last time - my favourite treats: some Cancoillotte, a bite of mature Comté, and a bottle of Monique Genevez’s Arbois wine. I would tread the last blades of grass, snap the last twigs, before the final plunge. My pilgrimage. My own personal Lourdes… hoping for a miracle.. It came to me during the night, in Monique Genevez’s gîte. from After The Crash by Michel Bussi (2015). Highly Recommended. 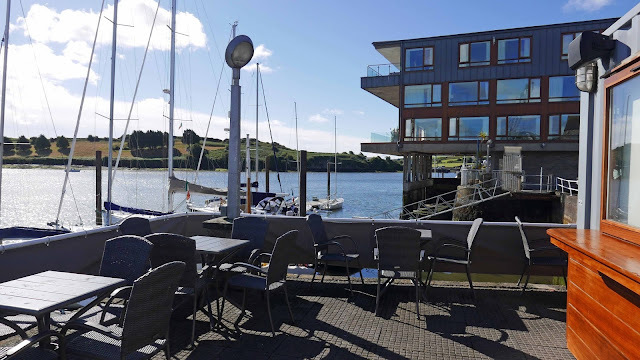 Pier One is the main restaurant at the refurbished Trident Hotel in Kinsale and we enjoyed a lovely evening meal there recently. 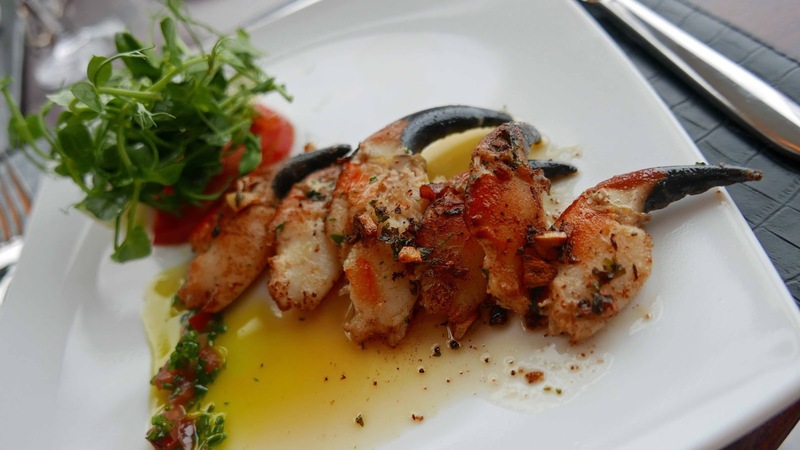 If you'd prefer something more casual then downstairs at the Wharf Bar is the spot to go, a lovely room with food all day long. And drink too, of course. Indeed, if you’re one of the many that likes a drink outside these summer days then, between car park and the harbour, the Trident have their self contained Foredeck Bar with some seating for your comfort. There was a coach load of visitors dining in Pier One when we arrived. But it was no bother to the efficient well practised crew on duty and the service at our table was top notch all through. We had menus, breads and water as soon as we seated and then got on with the “work” of making choices! And we had plenty to choose from. Here, they buy local “as much as possible” and we could see that, from the breakfast in the morning to the drinks at night. Drinks featured included Blacks of Kinsale, Franciscan Well, Stag Ban, Killarney Brew, Stonewell Cider, lots of Irish whiskeys, gin by Dingle and Kinsale and also Kalak vodka. I enjoyed a Crested Ten (one of Ireland’s most under-rated) in The Wharf, excellent service here too by the way, and they too were busy with people dining and drinking, some watching the British Open. The bar has a nautical feel – designed by local yacht designer, Rob Jacob, to resemble elements of an old sailing ship, it is complete with portholes, decking, vaulted panel and beam ceiling and rope-wound galleon masts. But back upstairs to Pier One. Once we took our eyes off the collection of Knuttle on the walls and the activity on the water outside, the boats coming and going, we made up our mind. My mains would be Roast Crispy Duck (a half! ), with wild berry, apple compote and citrus jus while CL went with the Seared Monkfish with carrot crisps and a Vermont Cream Butter Sauce. 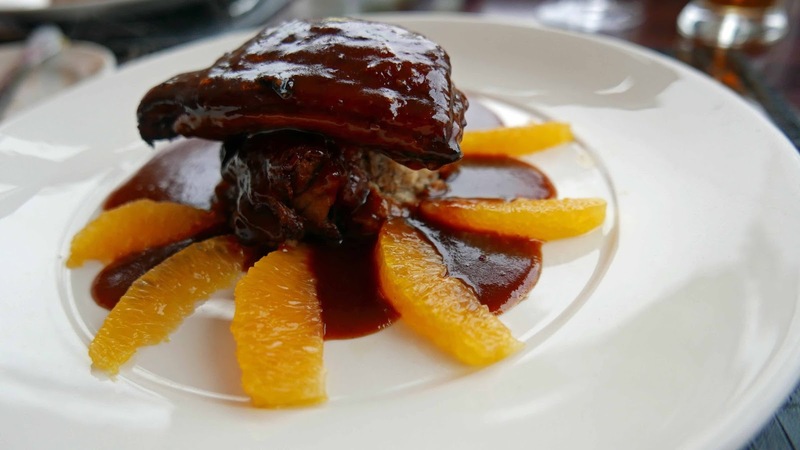 The duck was surrounded by orange segments and I certainly enjoyed this more exotic style, very well cooked by the way. And so too was the monkfish, a more simple dish though with a most gorgeous sauce, and another excellent combination. The side dish, of lovely vegetables, included courgette, celery, carrot and leek on the side. And all the while I was sipping my Kinsale Pale Ale by Black’s. The starters had been excellent also. My Pan fried crab claws, with garlic and coriander, were as good, if not better, than any I've come across previously. 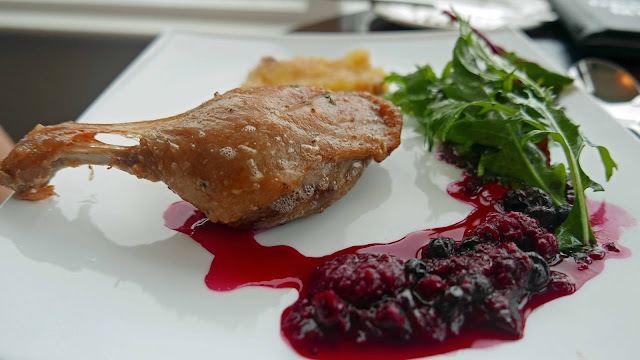 And The Trident style Duck Confit was dispatched, with no little pleasure at the other side of the table. The high standard was maintained with dessert. 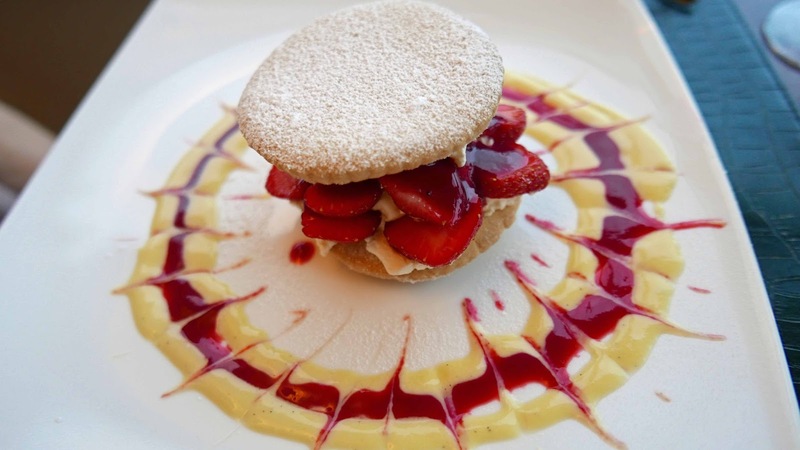 This time there was no sharing as we each picked the delightfully presented Rosscarberry Strawberry Shortcake, Crème de Menthe cream, Vanilla and Raspberry Sauce. Quite a plateful and a great sweet way to finish. We would be back in Pier One for breakfast. They lay on quite a spread here, with real cheese and ham included. Loads of fruit too, plus breads and cereals. And a choice of hot dishes of course, including the full Irish (and any variation you wish) and a fish option. We both went for the Eggs Benedict and, with the local Barrett rashers and the eggs by Riverview making a lovely impression, that set us up for the day. 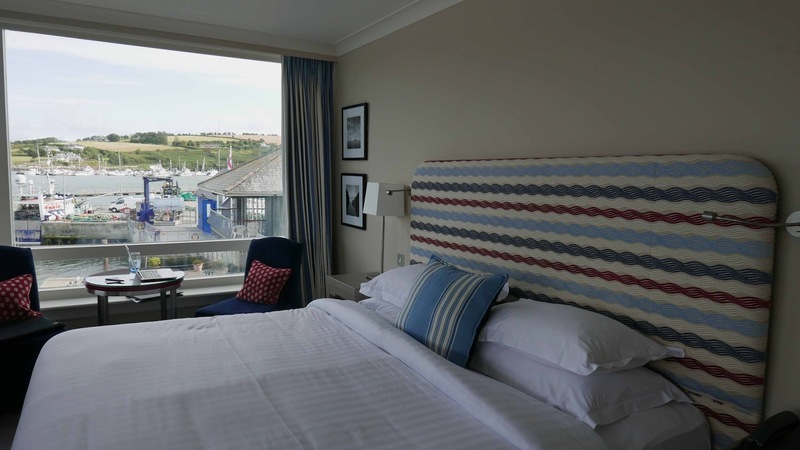 The 75 newly refurbished bedrooms include an executive wing comprising 30 rooms and a penthouse floor of 9 luxury suites, all with breath-taking views of the harbour and enchanting town of Kinsale. The hotel has a private marina, onsite parking and a wide range of state of the art facilities for conferences and is an unforgettable venue for family occasions. 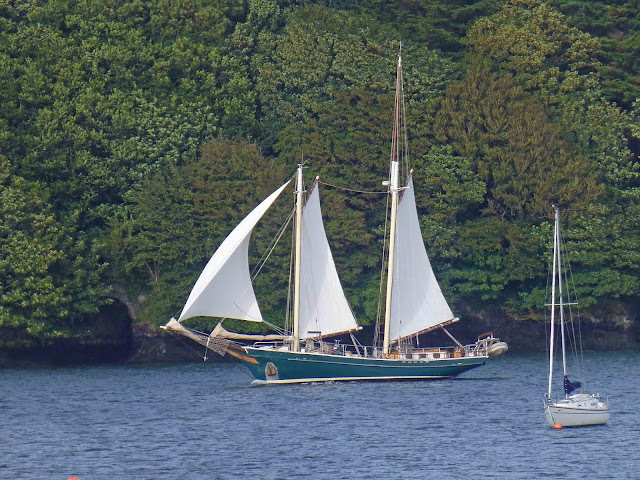 We stayed in one of those refurbished bedrooms and, with the sun obliging both in the evening and morning, we had splendid views of the harbour. The decor is restful and the spacious room had all we needed, including hairdryer (well, I didn't need that!) and tea-maker. The hotel is three-sided (the water's edge completes the square) and all rooms have a view of the harbour. While walking along the corridors, I was struck by the restful colour combination, mainly white and grey on the walls, blue and grey in the carpet, and a little extra colour in the curtains. All very peaceful throughout. A really lovely place to stay, good rooms, good food, and just about four minutes from the very heart of the town. Lots to visit here, most notably Charlesfort. But don’t forget the wine museum in the smaller Desmond Castle. 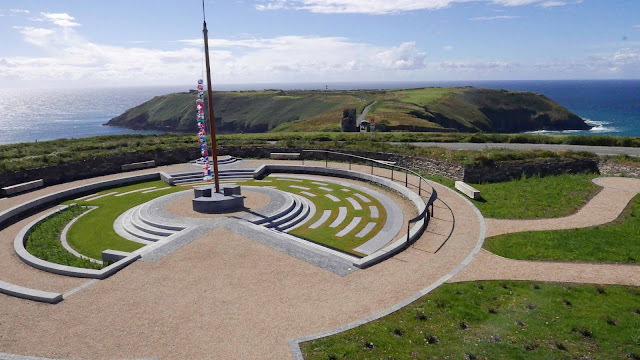 One of the new attractions is the Old Head Signal Tower and Lusitania Museum, a community effort alongside the Old Head itself. Good stories here and also splendid views over the ocean and the land, especially over the old head itself. Orschwihr: Hard to spell, easy to drink! 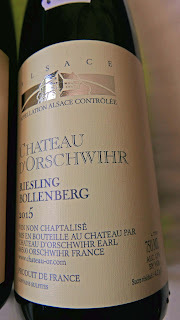 The Wines of Chateau d'Orschwihr: Hard to spell, easy to drink! The general timeframe of grape growth and wine production is about five or six years. 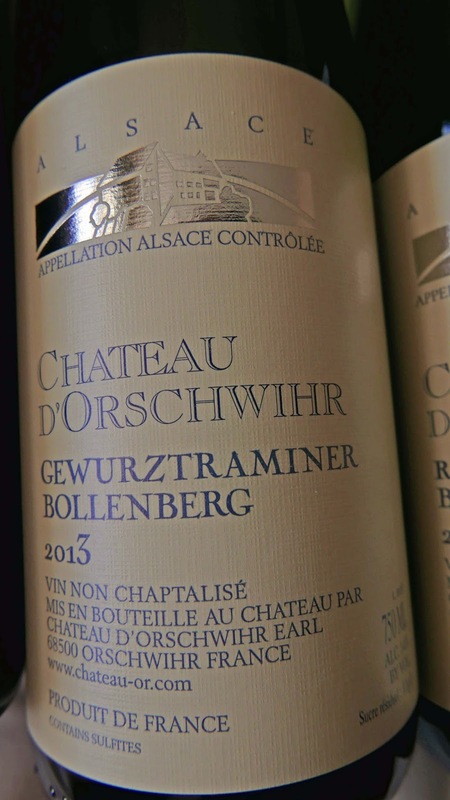 The aim at d’Orschwihr is to develop a sustainable and environmentally friendly viticulture which produces a raw material that in turn produces remarkable wine. This is achieved by applying certain principles and you may read about the château’s philosophy here. Colour is an appealing light gold. There are white fruit aromas, with citrus prominent. The palate is mouth-watering and flavourful, well structured with a balancing backbone of acidity, well balanced all the way through to the long rich finish. This gorgeous golden wine is Very Highly Recommended. Try with seafood and fish, not forgetting freshwater fish, pork and poultry too. Chateau d’Orschwihr Gewürztraminer Bollenberg Alsace (AOC), 14%, €21.85 Karwig Wines. Again, we have a lovely gold colour. Intense aromas, fruit, hint of honey. Intensity of fruit on the palate also, a terrific mouthfeel too, and a rich finish. Some sweetness too. After all, the residual sugar count is 9.3 gr/l, about twice as much as the Riesling. But it is pretty well camouflaged by the other elements. Very Highly Recommended. Match, they say, with spicy Asian dishes of fish and meat, especially Japanese food. My tip, tried and tested: Try it with Citrus White Chocolate Truffles by Skelligs Chocolate. 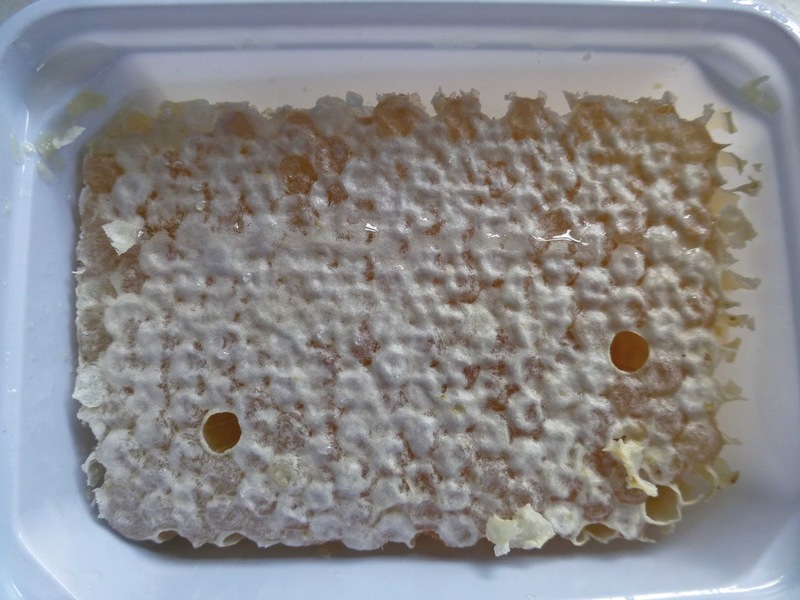 Raw honeycomb is a real delicacy of nature and our Taste of the Week. 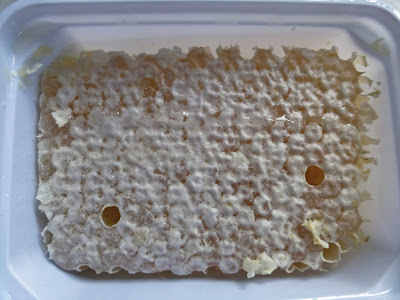 It is also one of the most efficient ways of storing the honey and I picked up my most recent honeycomb at the Killavullen Farmers Market. It is delicious plus any superlative you’d like to use. Stefan supports “healthy common sense living” and is worried, like many of us, about the decline in the bee population. 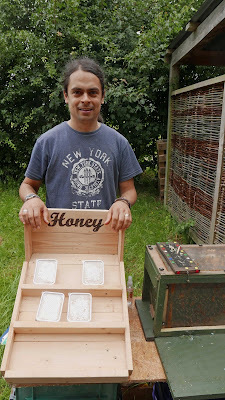 Life would be better if we take better care of the bees and encourage them. What happens if the bees die? Check out this video here. Jacques. High Standards Since 1980. Style and High Standards Since 1980. The warmest of welcomes. An evening meal of outstanding quality. An exemplary service. An evening to savour. Where? In Jacques Restaurant of course, where the Barry sisters, Jacque and Eithne, have reigned - morning, noon and evening - since 1980. Back in the 80s, you had hair to the skies and shoulder pads not far behind and the guys had big and obvious gold chains. Those fashions have long gone but the high standard at Jacques endures. 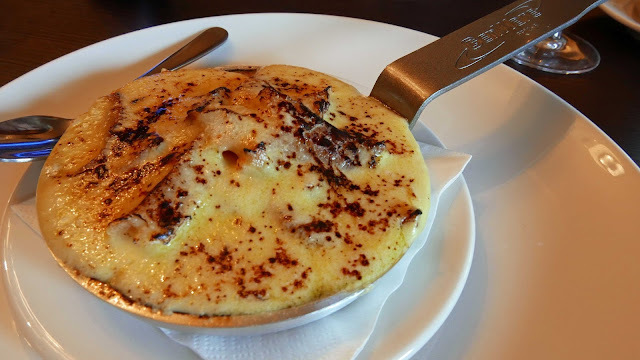 In early 2015, after an previous outstanding meal there, I wrote: For 35 years now, Jacques has been setting the standard for restaurants in Cork. 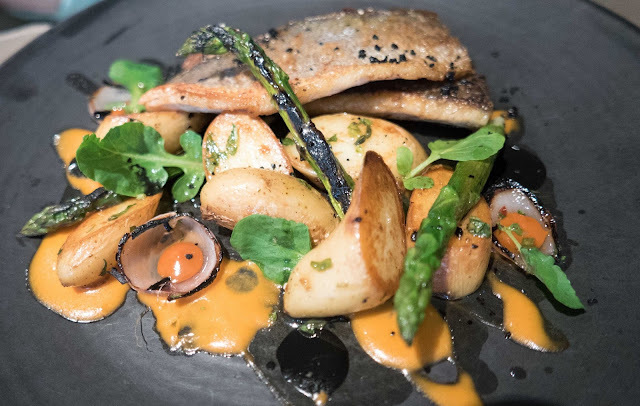 With the Barrys' unswerving commitment to local produce and high class cooking, it looks as if the calm and comfortable Phoenix Street venue will be the benchmark for years to come. No need to change an iota! Just as well we four had booked well in advance for our Friday night out. 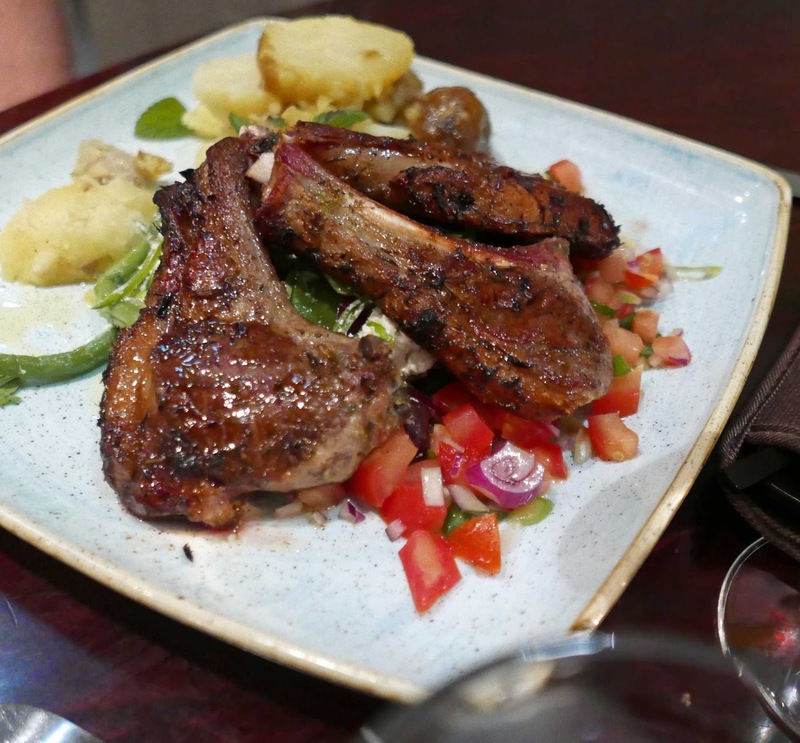 The main restaurant was full and there was a lively buzz too coming from the new-ish tapas section which fronts onto Oliver Plunkett Street. You can access both areas from either that street or the original Phoenix Street door. No delay in bringing the menus and water, breads too, to the table. 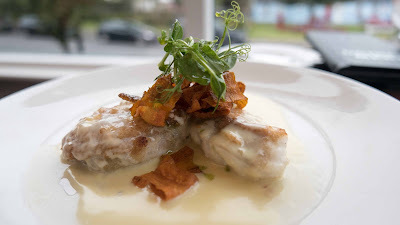 The A La Carte is quite extensive and we were immediately filled in on the specials. Quite a choice. That Lambs Kidney tempted me but in the end I picked the Fresh crab mayonnaise, new potato, mint, and the Busby strawberries from West Cork. Hadn't seen that combination before and it was delicious. CL enjoyed her Roast beetroot, quinoa, Knockalara cheese, saying the caramelised walnuts included were “divine”. 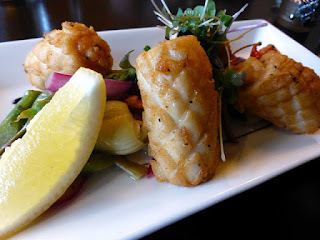 Got enthusiastic reports too on the Kidneys and also on the Fried Ardsallagh Goats Cheese Gnudi with cured egg yolk. Some excellent wines (and craft beers too) on the list. 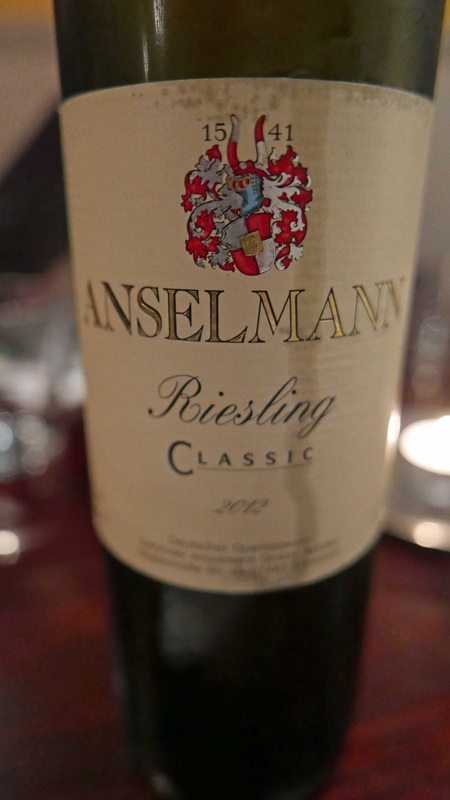 Indeed, the wine quality is very evident in those listed as house wines including a superb Anselmann Riesling Classic 2012. A pichet of Argentinian Malbec also went down well as did a bottle of Steininger Grüner Veltliner from Austria’s Kamptal. Now, for the main event. 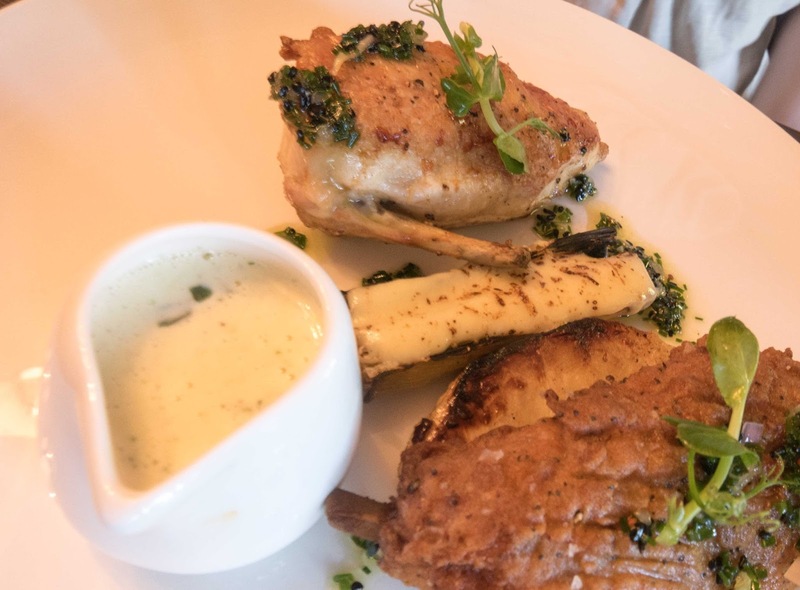 The Cork Lamb Cutlets were enthusiastically dispatched while the two ladies were very happy indeed with the fresh Hake, pan fried, lemon butter, crispy capers, parsley, Ballycotton queens and greens, a lovely plateful indeed. 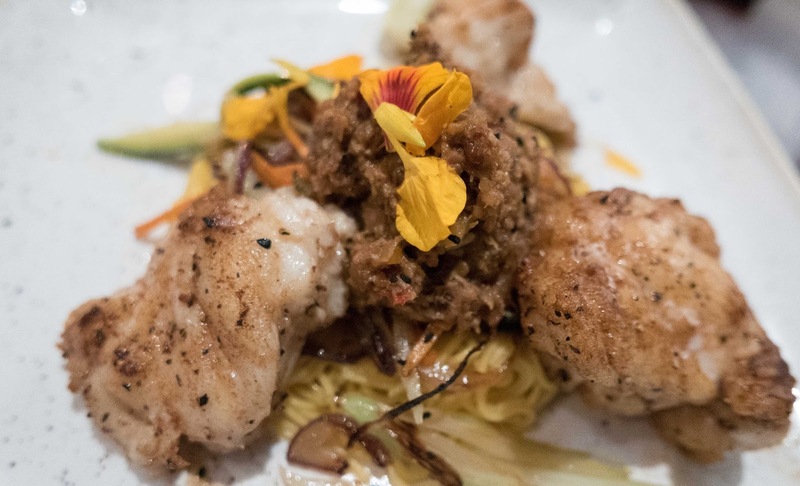 I went a little exotic: Fresh monkfish, Malaysian noodles, pancetta, chilli and black pepper jam and julienne of vegetables. I think I hit the jackpot with this one. It was perfectly cooked and the fish was superbly enhanced by the accompaniments. 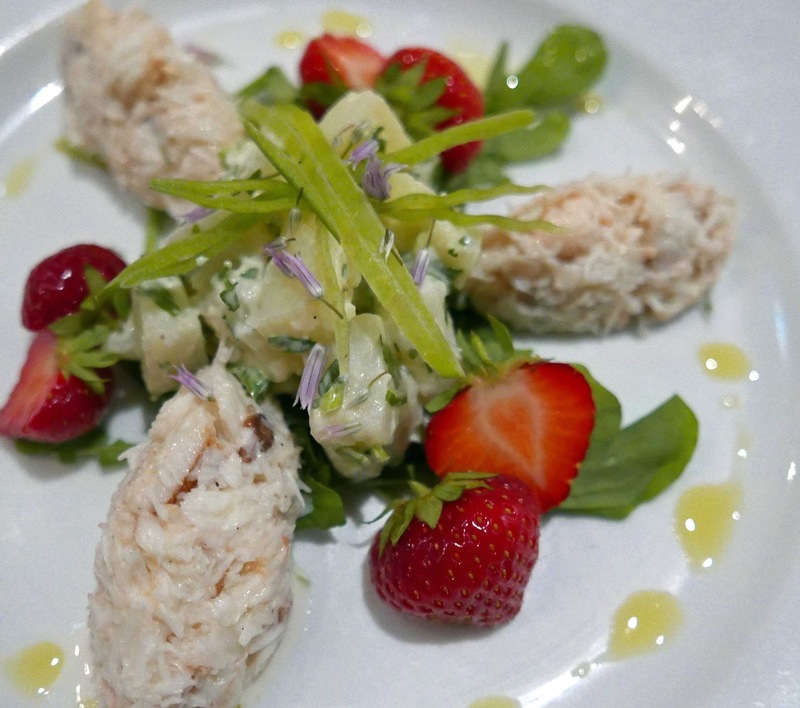 Just like my crab and strawberry starter, I would highly recommended this one! 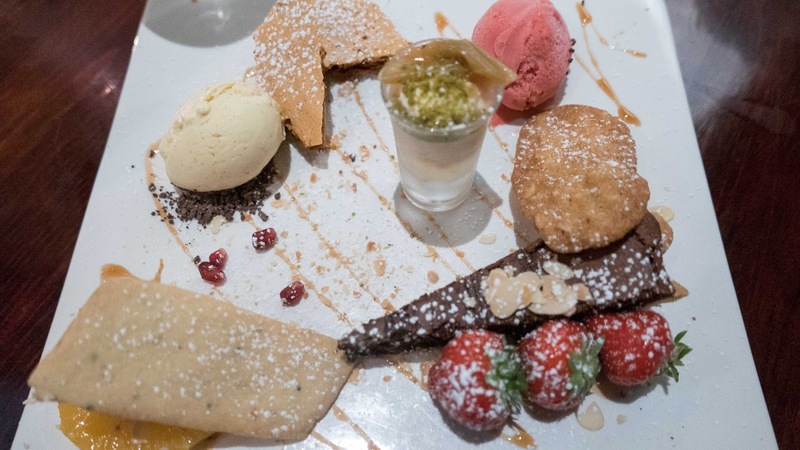 No big decision required for dessert as two sharing plates appeared. And soon disappeared! We four would soon head off into the city night, all talking about the marvellous meal and hospitality in a lovely place. I think we’ll be spreading the good word for a long while. Jacques, 23 Oliver Plunkett St and 9 Phoenix Street. 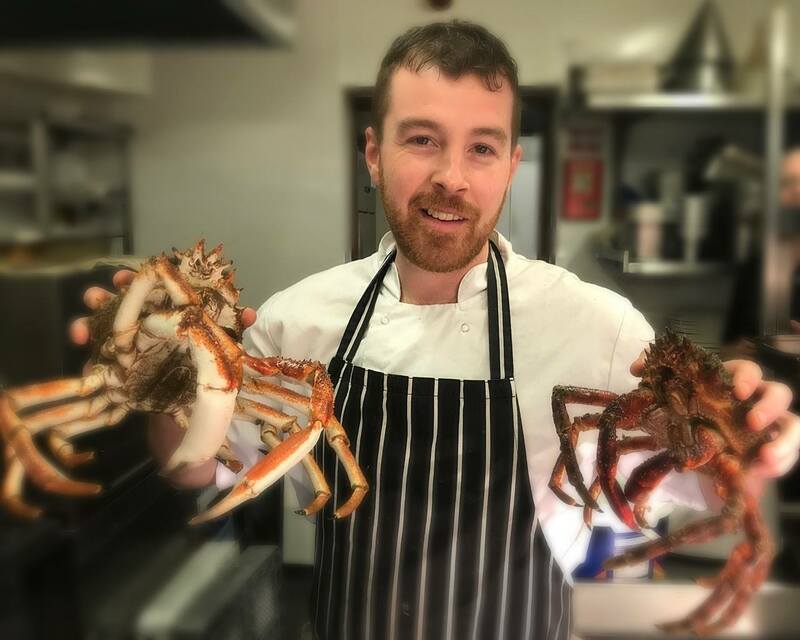 The Brook Inn in Sallybrook (Glanmire) has recently been included in a couple of national guides but Head Chef Greg Murphy is not resting on his laurels. 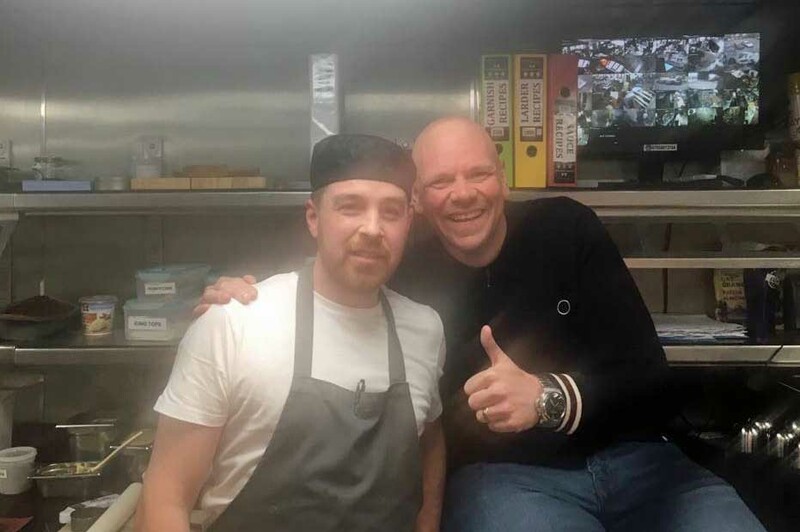 Every year he seeks to improve the offering and this year is no exception as he completed a stage* with Tom Kerridge of the famous Michelin two star “Hand and Flowers” pub in London. 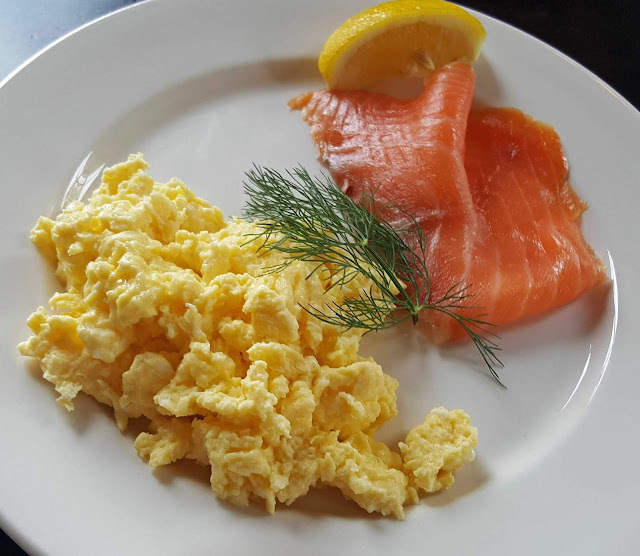 Greg supports local suppliers including Tom Durcan, Gubbeen Smokehouse, Carrigaline Cheese, Rathcooney Fruit Farm Strawberries, and the Green Field Farm. And he is a big fan of the English Market. I met Greg when I was back in the Brook last week to check out the new menus and straight away noticed the Glazed Omelette “Tom Kerridge”, smoked haddock, with aged Parmesan cheese. Well, that was my starter and an excellent one it was. But regulars needn’t worry. It is not all Kerridge. 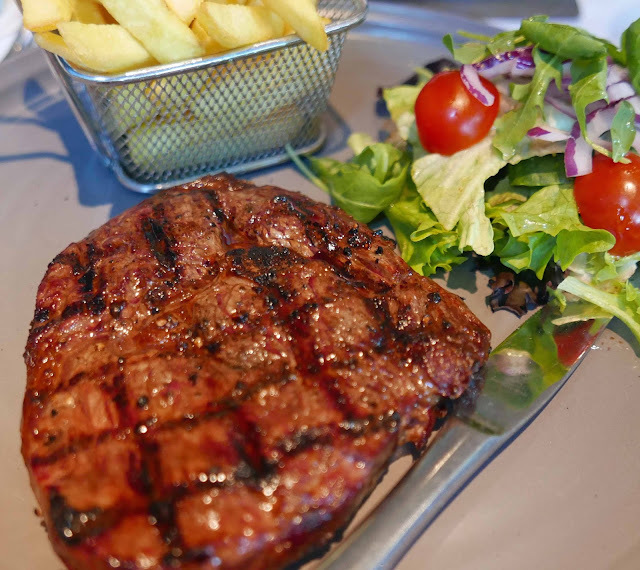 You’ll still have your steak, lamb, chicken and fish and other dishes for which the Brook is well known. There are a whole range of menus here including A La Carte, Set Dinner, Early Bird, Tapas, Breakfast/brunch, Finger Food and, this time of year, BBQ! Tom Durcan’s spiced beef featured on CL’s starter, a superb plate that came with pickled Enoki mushrooms, baby potatoes, olive oil, pea cress and red cabbage purée. Looked well and tasted even better. Quite a wine list here too, many of your favourite countries and varieties listed. I enjoyed a fresh and interesting Pecorino, an organic wine from Italy that matched well with the fish. 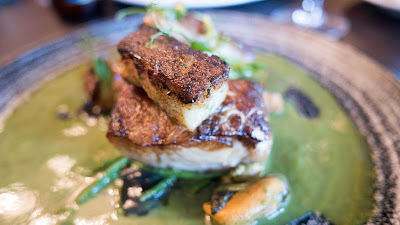 A grilled fillet of hake was my main course, accompanied by a spinach and basil velouté, charred lemon gel, mussels, brown butter gnocchi, and hazelnut. 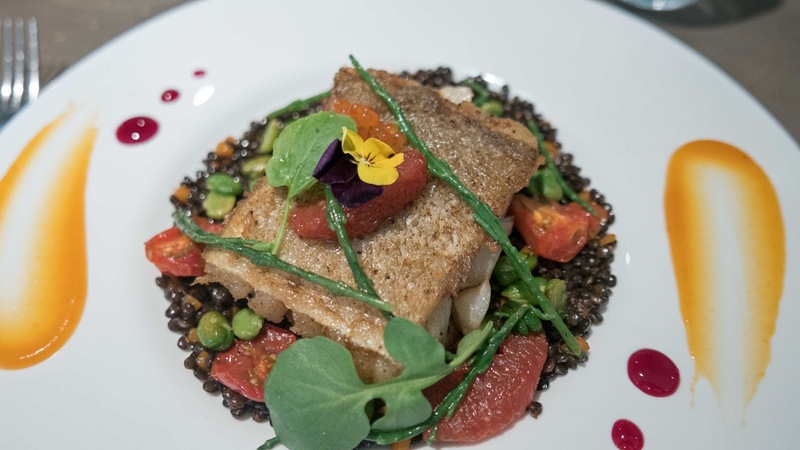 Well cooked, well presented and every ingredient played a role in a superb dish. CL’s pick was the Grilled breast of chicken, southern fried leg, leek, onion dressing, salt baked celeriac, purée Tarragon cream. The fried leg added an extra dimension to another excellent combination. By the way, there are a number of sides available and, yes, those Triple Cooked Chips are outstanding! 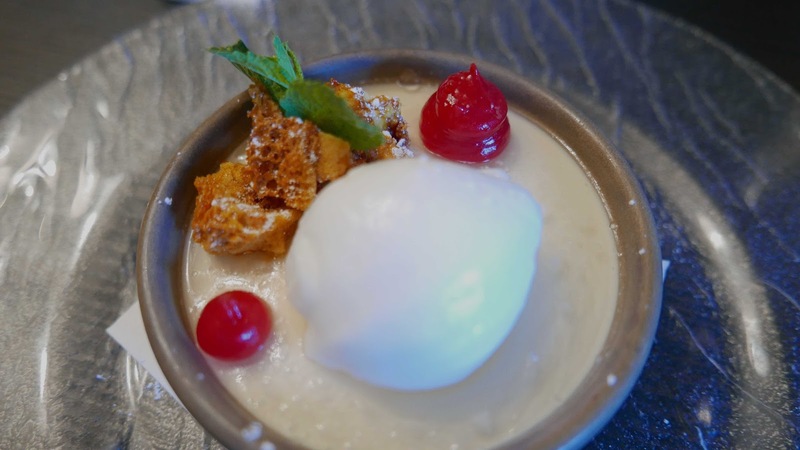 After all that, we decided to share a dessert: West Cork Cream, with honeycomb and a champagne sorbet. Easy to dispatch and delicious! And a lovely end to a lovely meal. 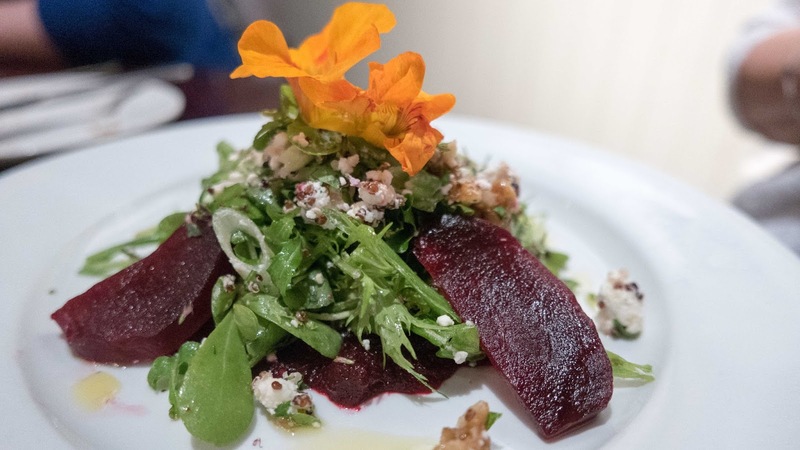 Excellent produce, top notch cooking and a friendly and efficient service from start to finish in a very comfortable room. The Brook Inn is easily found, on the road from Glanmire to Watergrasshill. It will be on your left, a well maintained building with lots of flowers at this time of year. There are a few parking spaces in the front while the main car park is at the rear. See the map here. * A stage (French word) is an unpaid internship when a chef works briefly (usually for a few weeks), for free, in another chef's kitchen to learn new techniques and cuisines. All he had to do was drive to a fish warehouse in Oakland, hand a slip of paper to a Chinese kid who worked for Fariq’s organization, and throw the squid into his van. From there, he’d take it to Fremont, put it on the ground, and come back the next day, when it had thawed. Then he’d open it up and pull out the vacuum-sealed loaves of drugs. I used to love squid, he told them later. I can’t eat it anymore. from Every Man A Menace by Patrick Hoffman (2016). Highly Recommended. 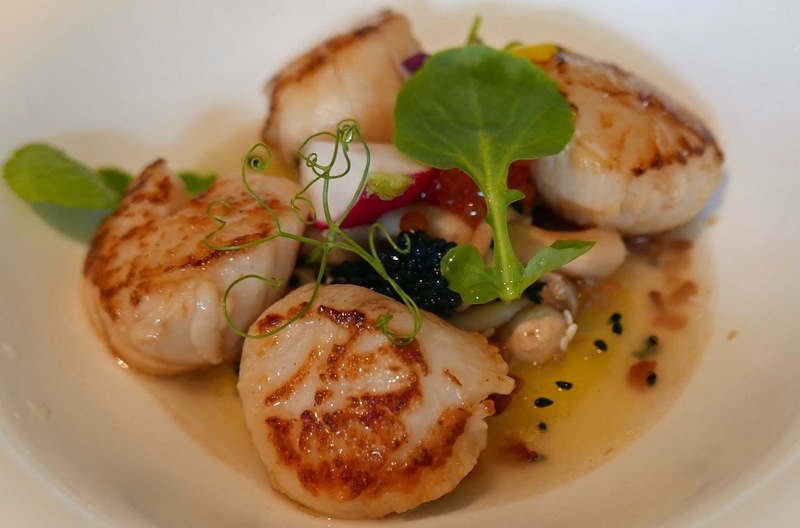 Hotel dining rooms are improving all over the city and Bellini’s at the Maryborough is at the forefront thanks to Head Chef Gemma Murphy and her team. Gemma is renowned for her presentation skills. But there is substance galore behind the style on your plate. She is well able to source good produce, with the emphasis on local and seasonal, and cook it to perfection. 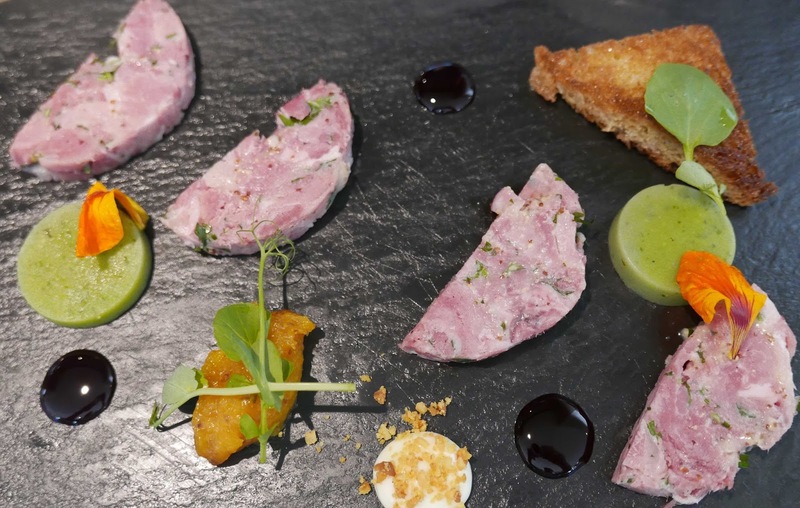 Macroom Buffalo Cheese, Goatsbridge Trout, La Rousse Fine Foods, Keeling’s Fruit and Vegetables, Matt O'Connell Seafood, the English Market and Ballinwillin Boar and Venison are among her sources. And it's getting even more local! She has developed a vegetable and herb garden “so she can ensure only the best will be used in her cooking”. Delighted to get the chance to try the new menu. After a warm welcome, we were seated comfortably and starting to make the choices. Not that easy as all the dishes appealed. I was looking at the starters and found it difficult to get past the first two. Eventually though the Ballinwillin Wild Boar (Pea and Watercress Pannacotta, Apricot Mustarda) “won” against the Grilled Mackerel. The boar and venison coming from the Mulcahy's in Ballinwillin is top notch and this superb dish added another dimension. CL too had a difficult choice toying with the Assiette of Summer Vegetables (with Macroom ricotta) before settling on the Scallops (Bacon Dashi, Compressed Pineapple, Picked Shimeji, Cubanelle Chilli Oil). Another winner. The dashi was poured on at the table and the little umami mushrooms, like everything other element, played a tasty role. No big creamy sauces for the chef here. We both went for fish in the mains and each of us was very happy. CL enjoyed the Sea Bream Fillets (Grilled Asparagus, Charred Onion, Salt Baked Fingerling Potatoes, Shellfish Bisque, Squid Ink Dressing) while my Pan seared fillet of Cod (Braised Beluga Lentils, Fava Beans, Heritage Tomato, Grapefruit and Saffron Puree) was another delight. And of course there were sides; the House Fries and Market Vegetables (a substitute on the night for the carrots) were our choices, both well up to standard. So how about dessert? Some excellent choices here. 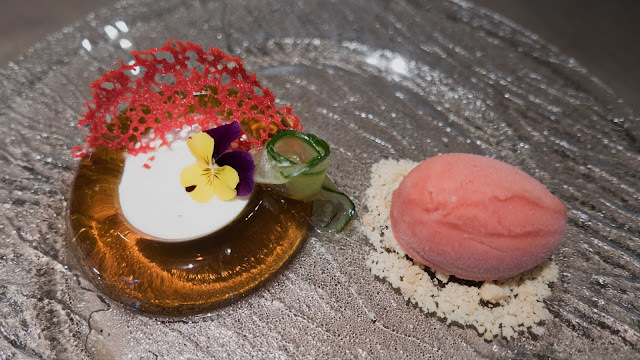 Was looking at the Coconut and Yuzu Pannacotta before settling on the Pimm’s Jelly (Foraged Elderflower Scented Mascarpone Strawberry Sorbet, Shortbread). That was shared, our server diplomatically placing it centre-table. Service was excellent throughout. And another empty plate went back! There are some fantastic wines on the list here, including quite a few by the glass and also a selection by the half-bottle. Once we decided on the fish, we ordered a glass of white each. One was the German Eins-Zwei-Dry Riesling, smooth and fruity and dry for sure. The other was the Ara Della Valle Pinot Grigio, smooth and persistent. Both feature on the house white list, along with a few more. If don't want the full menu of the restaurant, well take a look at the Bellini bar daytime menu here. Here too, you’ll see Lots of cocktails on offer and you can also sample the local craft beer by the Franciscan Well Brewery. And they also do Afternoon Tea in the Garden Room. And if the kids come, well there’s even an Afternoon Tea Menu for them. If you need to be pampered at any time, just follow the sounds of flowing water to the spa. And I'd better mention, they also have a gym! The winery was founded in 2003 and named for Marina Coppi, the child of renowned cycling champion Fausto Coppi who twice completed the Giro and Tour de France double, 1st in 1949 and then in 1952. The estate, which concentrates on native varieties, is in the region of Piemonte where the Colli Tortonesi is a lesser known appellation. Ten per cent Croatina has been included with the Barbera. No oak has been used and you'll note there is very little tannin. Ruby is the colour. There are intense aromas, mainly of cherry. Much the same fruit and intensity on the palate, also excellent acidity. As smooth and rounded as you’ll get with a trace of background spice. A beautiful lingering finish too and Very Highly Recommended. Liberty also carry the Coppi I Grop, another to watch out for. 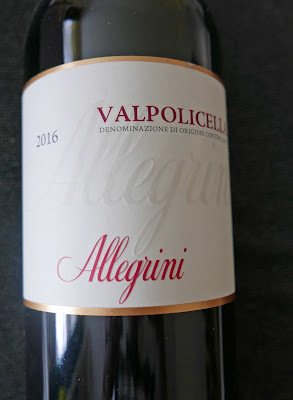 The Modern History of Italian Wine pays the Allegrini family, best known for their rich and powerful Amarone, quite a compliment when citing them as one of the most influential winemakers: With the Allegrini family, Valpolicella takes the form of art, of a lifestyle where the beauty and light of Italy shine through wine. Very high praise indeed. It might be a huge leap to see the art in this particular bottle but I’m inclined to the view that there is a delicate beauty and light to enjoy. And there is also a guarantee of quality as the family were, in 2005, one of the founders of the Comitao Grandi Cru d'Italia which unites the best of Italian producers. This Valpolicella is a light ruby colour, and bright. On the aromatic nose, cherry is to the fore. It is light, fruity, with a hint of spice. This engaging youngster is a playful companion, ideal for that favourite sunny seat in the garden. But will grow and mature a bit over the next year or two. A blend of Corvina (65%), Rondinella (30%) and Molinara (5%), with a finish of some heft, it is Highly Recommended. Read more of the Allegrini story on the Liberty Wines blog here. I’ve often heard of the camaraderie and support that exists between artisan producers. And I saw it in action at Schull Market on a recent Sunday morning. I was looking at the cheese selection on the Gubbeen stall when Tom Ferguson began to sing the praises (not of their own Gubbeen, which is worth a song or two) but of a two year old Coolea. He followed up by offering me a sliver. It was every bit as good as he said so I bought a wedge and it is our current Taste of the Week. No big surprise really. Coolea were one of the pioneers and the cheese is sought after at home and abroad. The cheese venture came about because the Willems family, wh had come from Holland, couldn't find any cheese here other than cheddar and mother Helena started, in 1979, on a very small family scale with a little pot. But now Coolea is a big name and much of the output is sold at the famous Neal's Yard in London while in Ireland Sheridan’s are the major customer. The cheese was to be called Milleens after the local townland but that was knocked on the head as the Steeles, further west on the Beara peninsula and living in a townland of the same name, had just started making a cheese called Milleens. And so the Coolea brand was born. It is firm and smooth, a pressed uncooked Gouda style cheese. Early on the flavours are caramel, nutty and floral but they become more robust as time goes on, sweeter if anything and still carrying traces of its delicate youth. A gorgeous cheese and well worth watching out for. 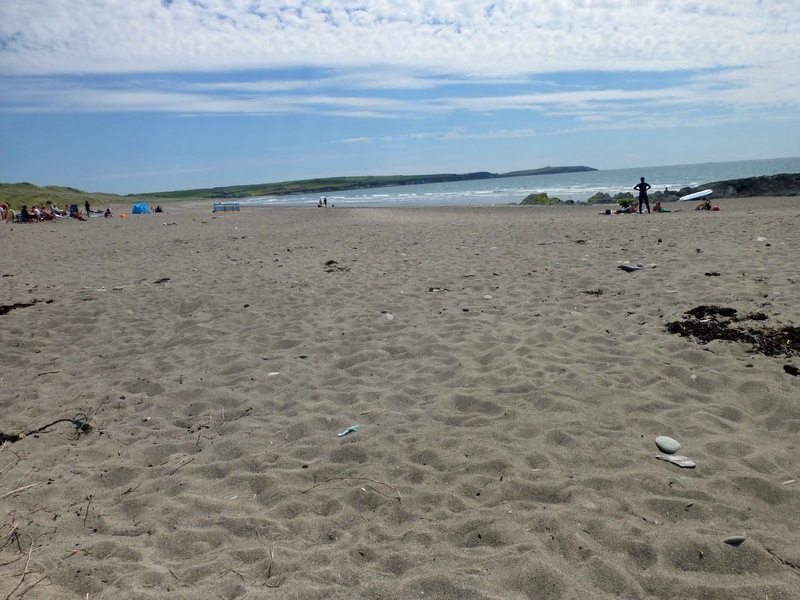 Pizza and Wine on a West Cork Beach. 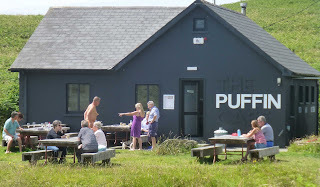 The Puffin Cafe at Castlefreke. The Puffin Cafe at Castlefreke. There is still plenty of room in the car park but many choose to park on the road. 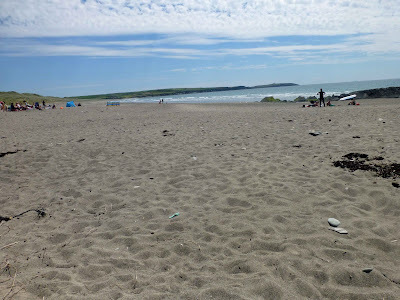 It is a typically Irish scene as you arrive at a beach-side car park on a sunny day. 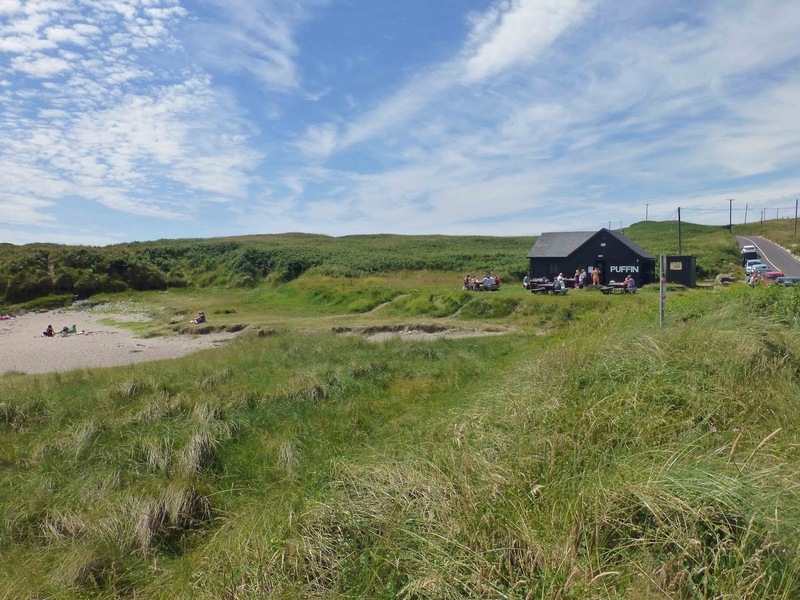 But what is not typical is the beach café, the only building on the Long Strand, Castlefreke. It is black, as black as a puffin’s back, and is named, The Puffin Café. Most of the action, well if you call sitting and lying action, on this sunny day is on the outside. A few brave souls, kids mainly, are testing the water. But there’s not a surfer in sight. Soon, the kids will be trooping up to the café, making the hard choice at the ice-cream counter, something like 14 varieties to choose from! Already family groups are eating at the big picnic style tables outside. Pizzas, and ice-creams and drinks, are in big demand. But the inside seats, and there are quite a few of them, are not! I'm happy with that. I've been out in the sun all morning and now glad of some shade. A lovely warm welcome and we are soon seated, checking out the menu which doubles as a place-mat. We note the names immediately, smiling as we go through them: Bowie, Salsoul, Rick Rubin, Chuck D, Jazzy Jay, Larry Levan and more are used for the pizzas. 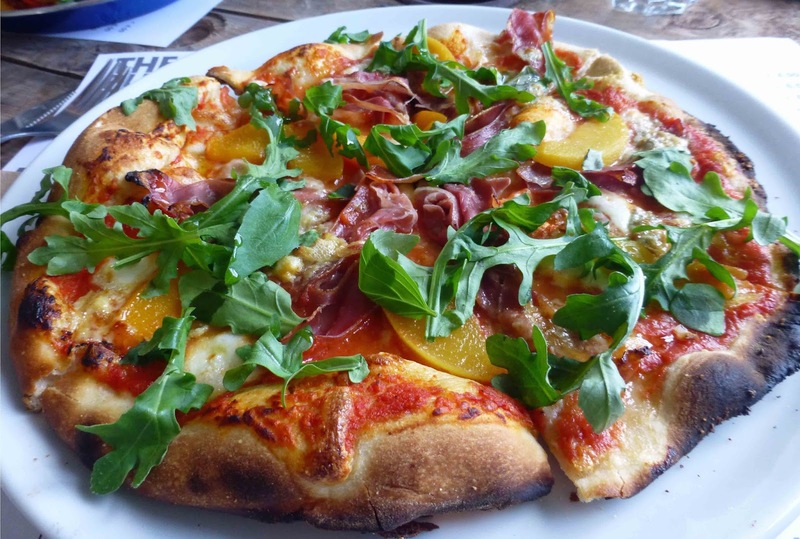 My pick is the Furious Five (€15.50), a welcome melange of San Marzano tomatoes, prosciutto, peaches, mozzarella, blue cheese and rocket. Quite an excellent pizza with the peaches working surprisingly well with all the rest. There were some nine pizzas on the list ranging from a Margherita (10.50) to a Fish offering, the Larry Levan featuring Smoked Mackerel and beetroot at €16.50. CL has picked something that little bit smaller, the Salsoul Sandwich (8.50). This tasty starter consists of Marsala Roasted chorizo, roasted peppers, onions and leaves and is served in a sourdough flat bread. See the full menu here. We drank lots of water as we ate but they do have wine here. From France comes Le Petit Pont Reserve in both red and white, at €6.50 a glass. From Italy, you can have the Costadoro organic white and red at €7.50 a glass or €28.00 a bottle. €28.00 also for a bottle of Prosecco. If you want something more expensive, then ask them about their small range “of quality and eclectic wines” that are off menu. Other drinks available are sparkling water, ginger beer, and pip organic. The name game continues with the desserts: Boney Mmm; B-Boying; Minnelli: and Freke Out! The latter, by the way, is the Puffin’s special Ice Cream Sundae. And, of course, you can also check out the ice-creams! No shortage of coffee choices (I thought my espresso was top notch) and you may have tea, ordinaire or herbal. Oh yes, almost forgot, there is music too at the café, outdoors on this occasion. All that, and sunshine, means a fun stop at the beach. The Puffin Cafe’s summer (June, July, August & September) hours are: MONDAY + THURSDAY + FRIDAY: 12pm-4pm. SATURDAY: 10am-10pm. SUNDAY: 11am-8pm. The White Horse Grub Club. Chance to try street food from the wide world. Chance to try street food from the wide world. There is something about the White Horse. The buzz. People. Everywhere. We walked in about 7.00pm on a Thursday. The restaurant was packed. The bar was full as we walked through to get to the Grub Club in a different dining room. The sign said “Sold Out”. So that bright and airy room was also full as was the lovely sheltered tiled patio area outside.. The Grub Club, an occasional feature, is just one of the many attractions of this lively spot. They have a music venue upstairs, a brew club, their own guitar (big) band and more. The Grub Club gives patrons an opportunity to try other cuisines, mainly street food style, from other cultures and Marlene had invited me along to sample the food of the West Indies. We were seated on the cusp of the indoors and outdoors and soon they began serving an introductory Caribbean punch to all the tables. Then the starter: Chargrilled Marinated Tiger Prawns skewer, mango salad, coriander, lime and chilli dressing, crispy shallots. 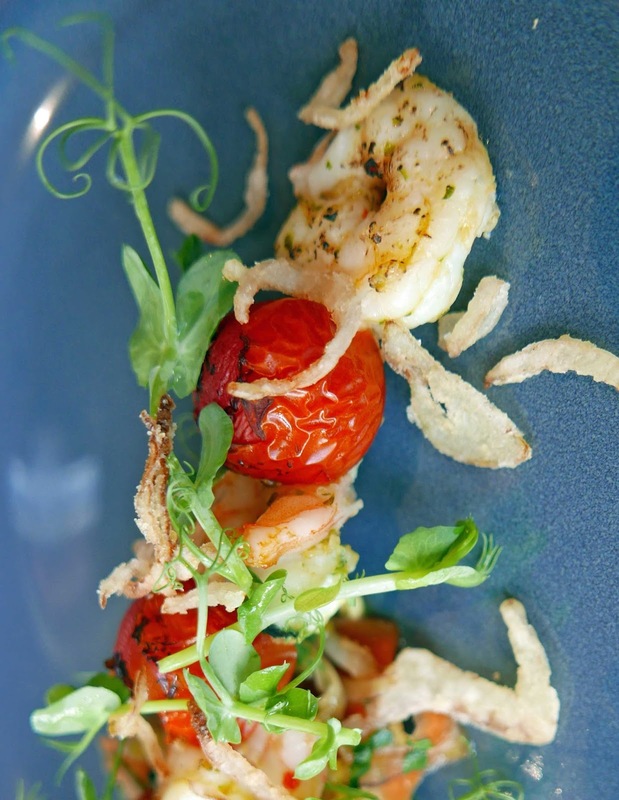 The salad was a treat on its own not to mind the prawns and juicy cherry tomatoes on the skewer. And there was also a paired drink: Spicy Coriander Bloody Mary. I skipped on that one but later enjoyed a cool delicious pint of the Bohemian Barefoot Pilsner by Eight Degrees, the suggested pairing for the main course. 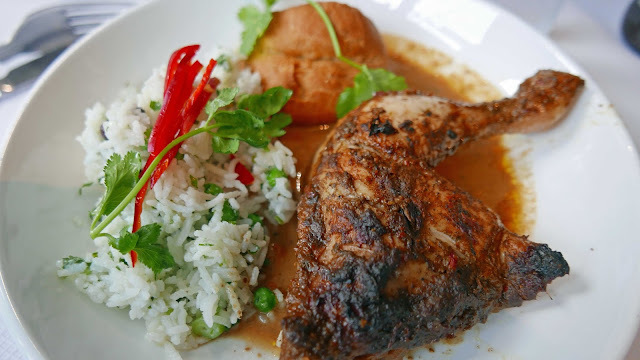 And what a main course, something very different indeed: Jerk Chicken, rice and peas (and a few beans too! ), homemade Jamaican Coco Bread, and Jerk sauce. Another totally enjoyable dish; the chicken was perfect, the sauce mild and ever so slightly sweet, the bread a delicious bite, handy too for taking up the last of the sauce! We were enjoying this and the buzz around the room. And the dessert maintained the excellent standard for this twenty euro meal (drinks extra). 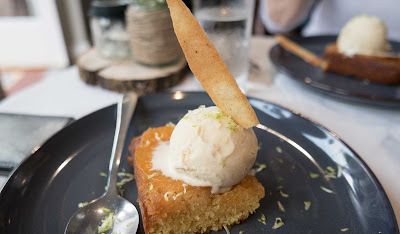 It was an Upside down caramelised pineapple cake, homemade coconut ice-cream, crispy cinnamon tuile. That really worked well and provided a sweet end to a lovely evening, even sweeter if you sipped the Basil and Cucumber Margarita. By the way, all the suggested drinks were a fiver. I must say that, with the large crowd in, the service was excellent. The staff pulled out all the stops to get all the dishes out as quickly as possible. 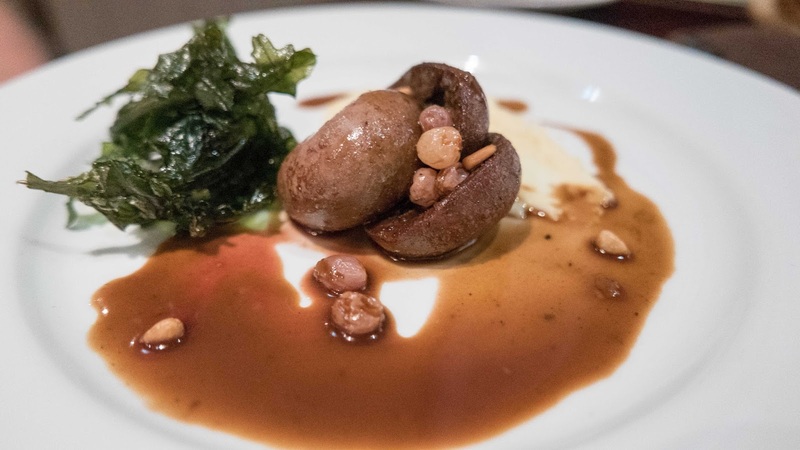 The Grub Club is a great idea, a reasonably priced night out with a chance to try something that you might not normally come across. The next event is scheduled for Thursday the 24th of August at 7pm. The menu is below and it is priced at €28 this time to include specially paired wines with each course. Tickets available from www.whitehorse.ie/venue and at the bar.